Plants have adapted to various climates. Today we will be exploring the adaptations plants have used to survive in hot dry summers and mild wet winters of California. We will be exploring the Rio Hondo College Wildlife Sanctuary located in Whittier, CA. The Sanctuary is a chaparral ecosystem which includes shrubs and plants that are somewhat tolerant of drought conditions. The rainfall is higher than is found in desert regions. However, the rainfall can be sporadic and occasional drought conditions are not uncommon. This type of dry brush is also easily set ablaze in the hot dry summer months and becomes the site of multiple wildfires each year. Chaparral plants have adapted to thrive even in the presence of wildfires. Some of these plants can regenerate from only a small section of undamaged root lying protected in the ground. In fact, some of these plants have seeds that require the heat of a fire in order to germinate! 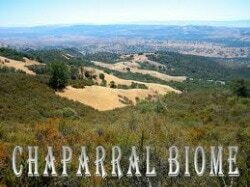 The chaparral found at this location is covered with plants from the coastal sage scrub community. This ecosystem is known for having plants with evergreen leaves. These plants do not loose their leaves. 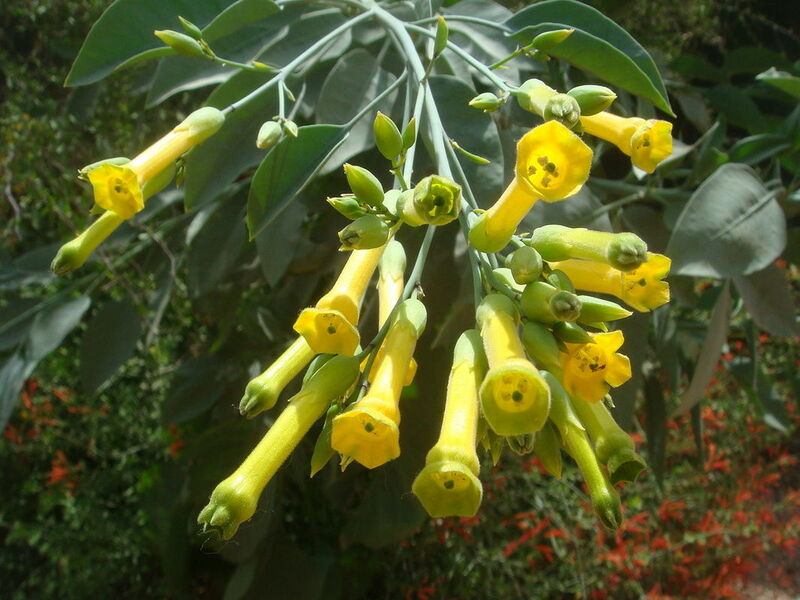 Tree tobacco is an invasive species commonly found in California. The plant is used for smoking tabacco and for medicinal purposes. The tobacco leaves have been used by Native Americans to treat swelling, bruises, cuts, wounds, boils, sore throat, and swollen glands. However, the leaves also contain a toxic alkaloid called anabasine that can be fatal if ingested! It may also be used as a fuel source for new formulas of biofuel! The Mule Fat is a flowering shrub with a peculiar name. It is native to the desert southwest of the United States and northern Mexico. The Mule fat is an extremely tough plant that can withstand drought and grown flowers year round. Horehound is a perennial herb belonging to the mint family. 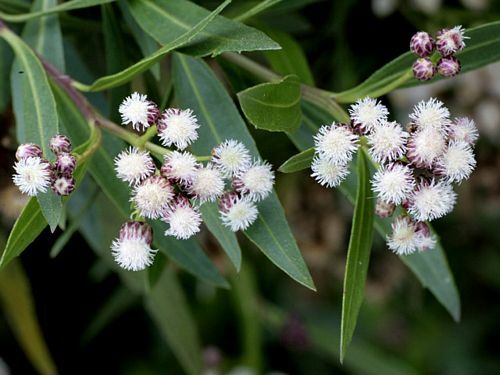 It is aromatic and recognizable by its oval leaves covered with white flowers. The leaves and flower of the horehound have been traditionally used as a natural remedy for the common cold, as well as a long list of minor ailments. Horehound can still be found in cough drops and homeopathic cold medicines. 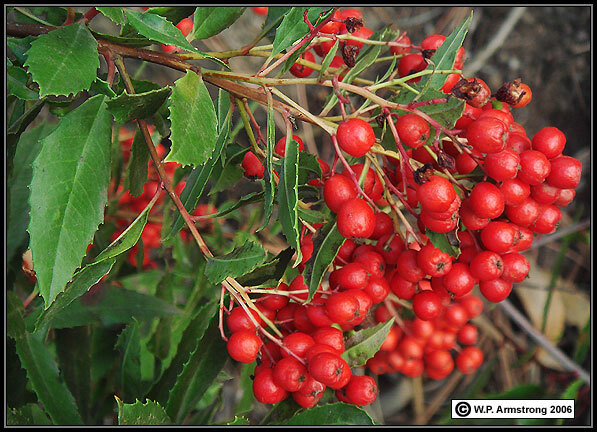 The elderberry is well-suited to the hot dry, fire-prone climate of the chaparral. the elderberry has thick leaves that retain moisture as a defense against hot dry summers. The elderberry is able to regenerate easily after a fire by using its leftover stump. The elderberry produces blue berries which are used by humans and wildlife as a source of nutrition. Interestingly, the immature blue berry is actually poisonous. 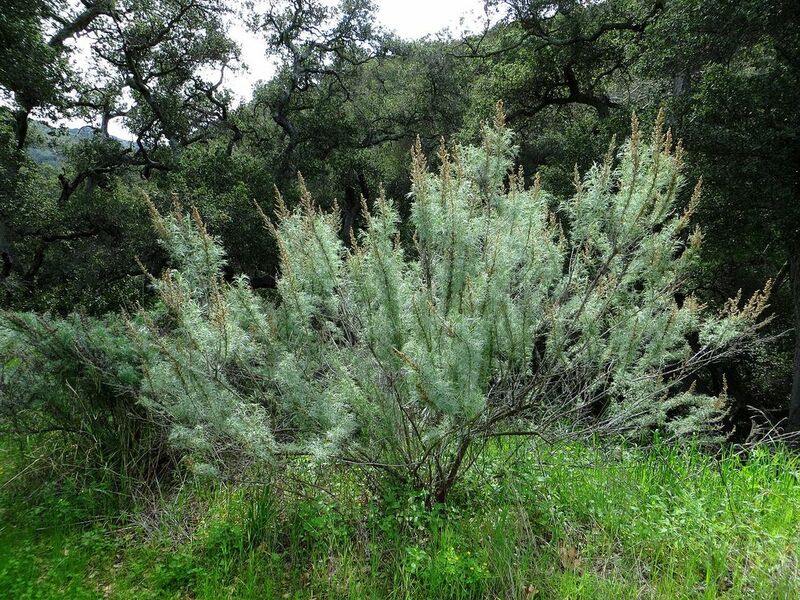 The California Sagebrush has a small base that spreads out with multiple branches. 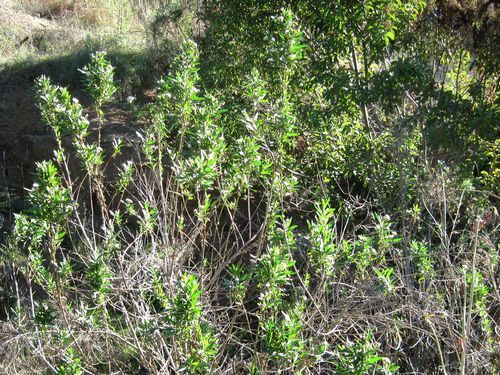 These shrubs remain somewhat small, reaching heights of about 5-8 feet. The leaves of the California sagebrush are hairy and vary in color from light green to gray. They also tend to curl under at the edges. 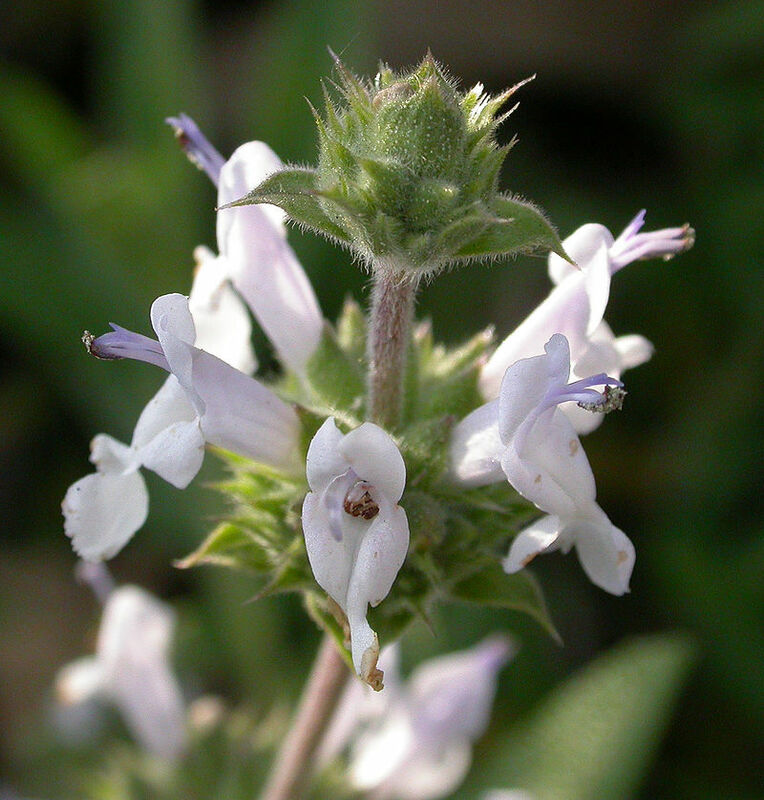 The Black Sage has a strong scent and will probably be the most dominant aroma you encounter in the chaparral. The black sage is a small coast shrub native to California and Baja California, Mexico. The Black Sage appears darker in times of low rainfall. The Lemonade-Berry has thick leathery leaves that retain water within the plant. This makes the Lemonade-Berry resistant to the drought conditions that are common in the chaparral. The oily substance on the berries can be harvested and made into a drink that tastes like lemonade. The Laurel Sumac has taco-shaped leaves that can grow to approximately 4 inches long. 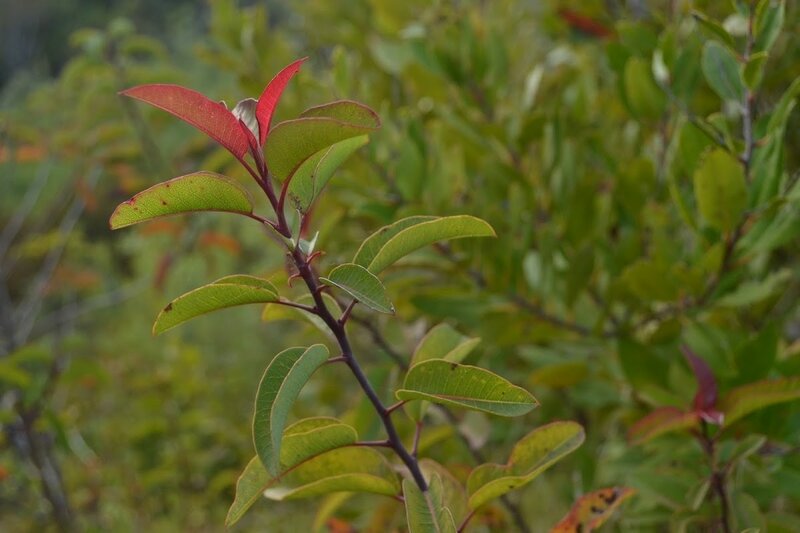 The stemmed edges of the leaves have a reddish color year round. 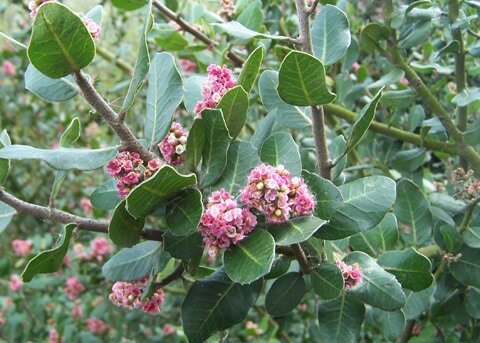 The Laurel Sumac has adapted to the fires of the chaparral by gaining the ability to regrow from only its roots underground. Poison oak grows in patches and can cause a painful itchy rash if touched with unprotected skin. It can grow tall or grow 13 feet tall or it can grow as a vine up to 100 feet long! The plant is winter deciduous, so that after cold weather sets in, the stems are leafless and bear only the occasional cluster of berries. (Deciduous plants are plants that loose their leaves). Without leaves the stems may sometimes be identified by occasional black marks where its milky sap may have oozed and dried. The California live oak is an evergreen oak. This means they do not loose their leaves and their leaves stay green year round. This oak is the only California native oak that is tolerant of salty ocean spray. It is also able to gather moisture from coastal fog. The gooseberry is also known as fuchsia flowering gooseberry or fuschia flowering currant. These shrubs are evergreen and grow up to 4 feet tall with red fuchsia-like flowers that emerge. It is summer deciduous (looses its leaves in the summer) if it is under drought stress. Mustard plants contain several species. Grinding and mixing the seeds with water, vinegar, or other liquids, creates the yellow condiment known as prepared mustard. The seeds can also be pressed to make mustard oil, and the edible leaves can be eaten as mustard greens. Recent research has studied varieties of mustards with high oil contents for use in the production of biodiesel, a renewable liquid fuel similar to diesel fuel. The biodiesel made from mustard oil has good cold flow properties and cetane ratings. The leftover meal after pressing out the oil has also been found to be an effective pesticide. Grasses are present in almost every climate and habitat on Earth. Grasses are a vital food source for many grazing animals and a wide range of other animals and insects. Grasses are resilient to grazing and quickly recover from cropping at the top. Grasses can easily take over fire-cleared areas if there are not enough grazing animals to keep the spread in check. The thistle is an invasive species of flowering plants that have sharp prickled leaves and stems. The prickles are an adaptation that protects it from hungry predators. The thistle can be biennial (living 2 years) or perennial (living more than 2 years). The short life cycle of the thistle helps the plant survive the hot dry conditions of the chaparral. In years of extreme drought, the thistle can greatly speed up its life cycle, completing its life cycle in as little as 3 months. This behavior leads to many normally biennial plants being treated as annuals in some areas. Hollywood, CA got its name from the California Holly Bush that dominates the hills of the Southern California Coast. 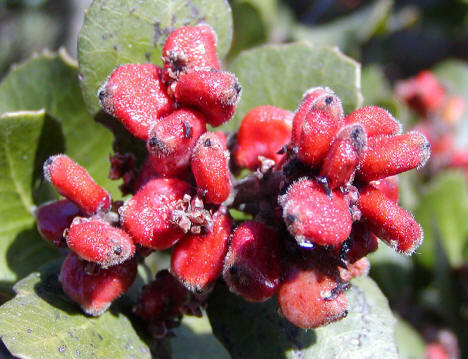 The California holly bush has adapted to the hot dry conditions of the chaparral.